A global partnership headquartered at the Boston University School of Law has decided to combat a serious threat to the world’s global health: antibiotic resistance. The group CARB-X, or Combating Antibiotic Resistant Bacteria Biopharmaceutical Accelerator, led by BU law professor Kevin Outterson, launched in August 2016 in response to former President Barack Obama releasing the Combating Antibiotic-Resistant Bacteria National Action Plan in 2015. The initiative presents a guide for both public and private interests dedicated to addressing the growing hazard to society with a projected timeline of 25 years. In the 2015 CARB findings, the Center for Disease Control holds drug-resistant bacteria responsible for two million illnesses and 23,000 deaths per year in the United States. “One of the major problems in this space is lack of new drugs that are available for patients — currently, there are not enough products in development to meet either current or patient needs,” said Carolyn Shore, an officer on the Pew Charitable Trusts Antibiotic Resistance Project, a CARB-X partner. CARB-X responds to the massive threat through a partnership approach. With a comprehensive collection of field expertise in disciplines from law to science to business, the organization presents a new push toward progress and achievement. By providing funding, guidance and a diverse support network, CARB-X promotes new research projects undergoing their innovation and development processes. An executive board organizes collaboration with partners including the Biomedical Advanced Research and Development Authority, Wellcome Trust and the National Institute of Allergy and Infectious Diseases. “Nearly all of the antibiotic products that are available to patients are based on discoveries from over 30 years ago,” Shore said. The time difference emphasizes the time sensitive nature of the issue, Shore added. “We have been working for some number of years on innovation of some antibiotics through identifying some of the gaps in basic science that impede the discovery of new drugs as well as incentives that are needed to spur development of novel therapies,” Shore said of Pew’s work that aligns with the CARB-X initiative. The aforementioned incentives provide a boost to an industry lacking in commercial funding. With $250 million in funds, CARB-X can provide worldwide research projects with aid to continue developing. “Commercials companies haven’t really invested in it,” said Nahid Bhadelia, the director of Infection Control and Medical Response at National Emerging Infectious Diseases Laboratory at BU. A central part of CARB-X’s support for the fight against antibiotic resistance stems from its ability to incentivize companies to produce new, novel products through public and private funding. “We actually received a lot more applications than we actually thought we would … they’re from all over the world which is really exciting — we have a few different [application] cycles going on at each time,” said CARB-X fellow Samantha Hirsch. CARB-X announced its first recipients in March. Although the project has strong scientific leanings, its headquarters in the BU Law School remains pertinent. The organization’s appeal also draws from the multi-faceted approach to enacting change. “Work like [CARB-X’s] actually helps facilitate bringing together different parties and the right regulatory components to make sure that this agenda of getting new target therapeutics for bacterial infectious diseases out on the market,” Bhadelia said. 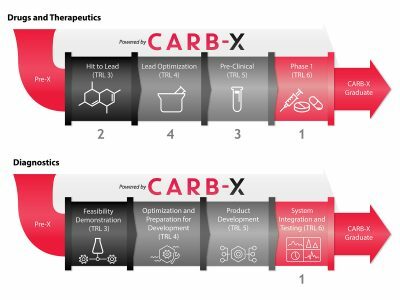 Although CARB-X is only in its inaugural year, its strides toward medical improvement have the potential of solving a critical issue.